In just a few days, people everywhere will be celebrating Read Across America Day with red and white striped hats, crazy blue hair, bellies that declare themselves "Things", wild and wacky socks, and green eggs and ham. It is one of my favorite days of the year. 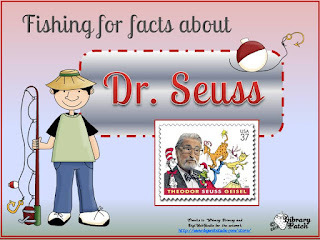 In my library this week, I will be using a fishing inspired PowerPoint presentation to introduce new facts about our favorite author, Theodor Seuss Geisel. 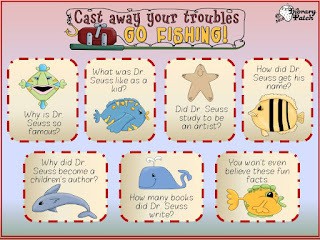 Each fishing rectangle on this slide has a question regarding Dr. Seuss' life. 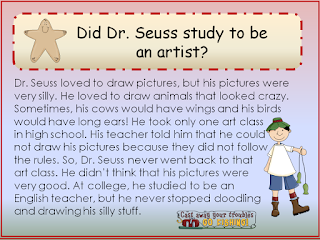 For example, the starfish rectangle says, "Did Dr. Seuss study to be an artist?" When you click on that rectangle, you are brought to a slide that gives the answer. It's just a quick little way of sharing some bibliographical information in a twisty way. In honor of Dr. Seuss' birthday, you are welcome to download my PowerPoint file for free. Simply click on either of the two pictures above and download from my Google Drive. Happy Birthday to you, Dr. Seuss! !